The premise sounds simple enough. 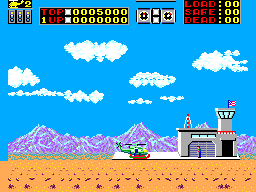 Use your military armed helicopter to free and rescue hostages. To do this you must make your way to prison, destroy it, pick up the hostages and return them to base. 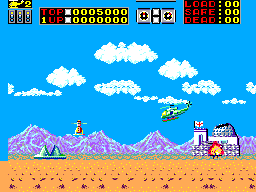 The game was actually very similar to the arcade version which was rare for the time. Solid. Great controls and simply defined missions make the game great fun. Though difficult the game is not overly challenging. The levels get increasingly tougher as you get closer to saving all the hostages. 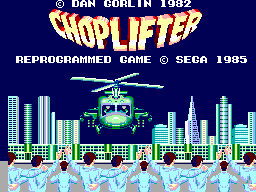 The game gets tough when after you make your way to the prison and destroy it you must land so all the hostages may board the helicopter. This sounds simple but if you stay in one spot too long you will be shot by enemy fire. Also landing is tough because the hostages immediately run out of the prison making it tough not to land on them. If you land on them they will be crushed. Pretty good for their time. Where they would pale in comparison to today's standards I don't think it's fair to make that comparison. They stand up good against any other game on the SMS and against any game on the NES. Good use of colour and everything looks like what it is supposed to be. Very good considering I think this was a launch title. The sounds are good. The music is not the music becomes repetitive if not annoying. The sound effects though are right on. With explosions and shots being fired this game was seemingly ahead of it's time. Spot on controls make flying the chopper a breeze. The controls are very responsive and tight giving a great feel. Possibly the games best feature. Okay. Though the game is great fun and a good challenge there is nothing that would change the game at all each time you play. So game play could become repetitive for some. I would recommend this game to anyone. No collection is complete with out it. One of the first games released for the SMS, the game play still holds up today. Fun and challenging, it's a good buy especially since it can be found for about $5.